In 2006, it's sort of funny to remember the lengths that kids in the 1970s had to go to in order to enjoy some of their favorite film and TV entertainments. Since the VHS wasn't yet around (or more accurately, not yet affordable...) and since DVD was a long way off, we kids of the disco decade had to combine a patchwork of toys, model-kits, books and comic-books to re-live King Kong (1976), Star Wars (1977), Star Trek (1966-1968) or the Six Million Dollar Man (1973-1978). "There's a new viewing thrill in store for you and your family with this handsome VIEW-MASTER Lighted Stereo Viewer. Modern advancements in design have been built into this fine instrument to provide easier and more convenient stereo viewing. Your VIEW-MASTER pictures have more brilliance, more beauty more "come-to-life" realism. " This toy is equipped with a "convenient light lever," a "handy scene change lever" "more brilliance," "larger picture" and "superb styling." 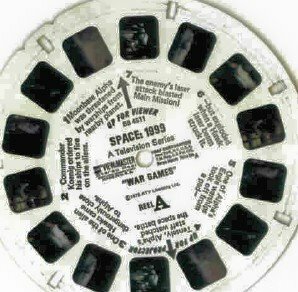 For those who don't remember how to use the handy ole View-Master, you just insert your View-Master reel into the "slot on the top of the viewer" and proceed from still-to-still, just like you're watching a movie...kind of. For a price of just 2.99 each, you could watch the "Talking" packets and for $1.75 each, you could get the standard three-reel packets. And what a selection GAF provided. In terms of movies you could see James Bond in Live and Let Die, The Poseidon Adventure, and King Kong, to name three. In terms of TV shows, you could enjoy Adam 12, Batman, Bonanza, The Brady Bunch, Emergency, Flipper, Gunsmoke, Kung Fu, Star Trek, Space:1999, Happy Days, Land of the Lost, Island at the Top of the World (anyone remember that one? ), The Six Million Dollar Man, Sigmund and the Sea Monsters, Run, Joe, Run and Planet of the Apes. Why, there was even a packet for The Waltons. Good night, John-Boy. 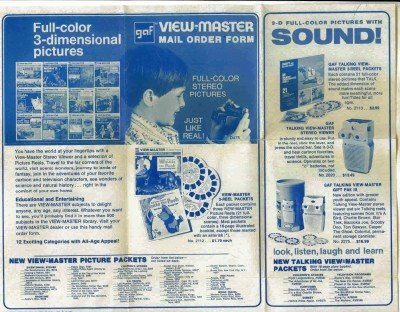 Of course I remember Viewmasters. I have my Viewmaster (not the one with the supplementary light, though) and several dozen sets of reels upstairs. I believe I have ISLAND AT THE TOP OF THE WORLD; if not, I have the VHS tape (DVD is available; not sure it's worth it at full price). Also have THE WALTONS (and all three LASSIE sets). They originally were made by Sawyer and go back to the 30s or 40s. 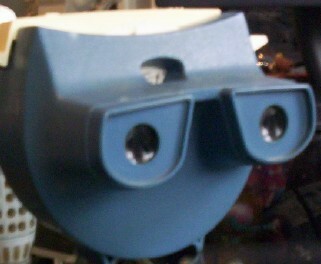 I have a plastic one now, but my original Viewmaster looked as if it were made out of Bakelite. If it wasn't, it was some other very solid plastic material, with a metal viewchanger. 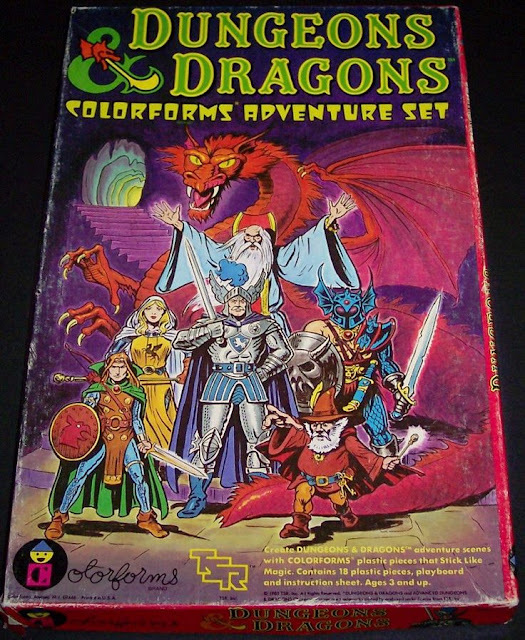 When I would go on vacation with my parents, we would buy the Viewmaster travel sets of whatever attraction we had been to. So I have reels of Disneyland in the 70s, Washington DC, Busch Gardens in VA when it was known as "the Old Country," etc. View-master reels were terrific. Even better than a DVD, we got to see scenes from our favorite movies and tv in sharp 3-D! No pixellated pictures! 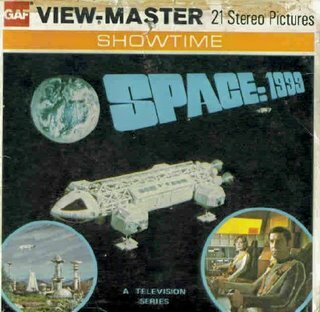 In addition to classic Trek, and Space:1999, I also treasure another View-master reel, UFO (it's the best way to appreciate the terrific model work). Some reels are better than others. For example, many of the pics from Star Trek: The Motion Picture are simply 2-D publicity photos, with the 3-D effect achieved by pasting the photos onto an unrelated background. All the photos from classic Trek were in true 3-D. Unfortunately, effects photos (for classic Trek) featured a small Enterprise model in front of some Christmas lights. Understandably, process shots weren't available in 3-D. I don't think Star Wars reels were ever made. It would be great to see those classic scenes in 'three dimensions'...almost like seeing the props in one of those Star Wars museum exhibits.